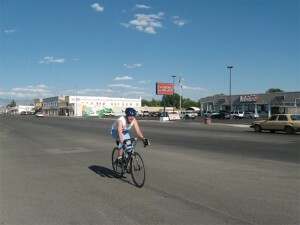 A cyclist drills it through Delta’s central business district, on Main Street. The Delta-Sevier River Ramble is a 22.8-mile loop on nearly pancake-flat roads in the Sevier Desert. The ride visits Delta, Deseret, and Hinckley on this eastern edge of the Great Basin. Canals extending from the Sevier River to the east enabled the introduction of agriculture to this otherwise dry area. The presence of water tames what would otherwise be a somewhat hostile environment. Elevations vary almost imperceptibly on the ride, from 4,586 feet in Deseret to 4,649 feet in Delta. The ride starts on the east side of Delta City Park, 100 North and 100 West, in Delta. To get there from I-15, take exit 225 (Nephi) to SR 132 west. Junction to US 6 south in Lynndyl. Bear right at the US 50 junction and continue into Delta. Turn right at 100 West to access City Park. The Sevier River originates on the Paunsaugunt Plateau in northwestern Kane County, in southwest Utah. From there, the river flows in a horseshoe shape some 280 miles before emptying into Sevier Lake in west-central Utah. Sevier Lake is nearly always dry, however, because most of the waters of the Sevier River are diverted for irrigation. The lake reappears after heavy, continuous rainstorms, such as occurred during the mid-1980s. When the lake does exist, it is endorheic, meaning that it has no outlet and is salty, similar to the Great Salt Lake. 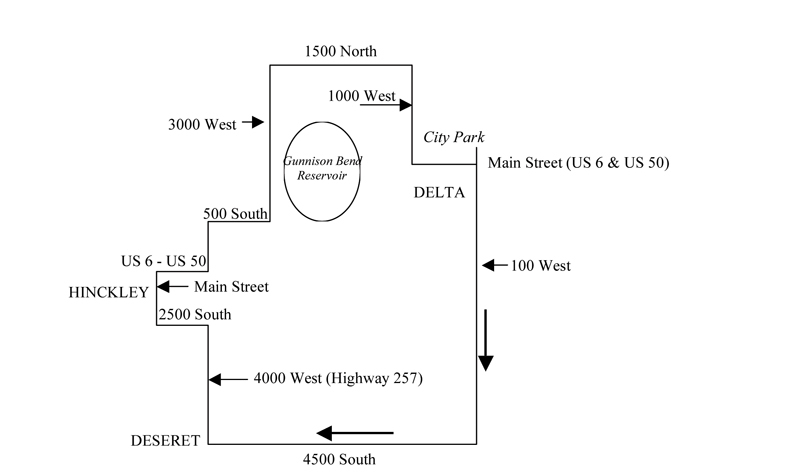 The city of Delta was settled in 1907, somewhat late for a Utah town. Pioneer Mormon settlers sought out lands that were suitable for agriculture and grazing before venturing westward into the hostile Great Basin Desert. A canal was built into the area, opening up possibilities for agriculture. The region soon became an important producer of alfalfa seeds and sugar beets. Delta attracted new interest when, in 1942 during World War II, an interment camp for Japanese residents was opened at Topaz, about 7 miles to the northwest. During its peak residency, Topaz housed 8,255 Japanese, making it the fifth largest settlement in Utah at the time. Remnants of Topaz, including the foundations of old buildings, still exist. Today, Delta’s economy is heavily dependent on the mineral and power resources in the area. The Intermountain Power Project, a coal-fired electricity-producing plant, is located north of Delta. The plant supplies most of the power for Los Angeles, California. At the Brush Wellman plant, also north of the city, beryllium is mined and refined at one of the few concentrated sources of this lightweight metal. Delta is also a good base for geological prospectors (i.e., rock collectors) who are attracted to the abundance of specimens nearby. The city, with a population of 3,172 in 2008, is arguably the largest settlement in the 200,000-square-mile Great Basin. A number of towns grew up around Delta to facilitate agricultural activities. These include Abraham, Deseret, Hinckley, Oasis, Sugarville, Sutherland, and Woodrow. None of the settlements are incorporated. 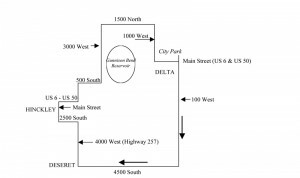 Start by heading south from Delta City Park on 100 West to Main Street. Cross Main Street (careful—the road is wider than you think), and continue south. Leave Delta around mile 1.0, entering the agriculturally-dominated open space that surrounds the city. The road passes a few farms and residences. Turn right at 4500 South and head west. Enter the community of Deseret at mile 8.0. Deseret was settled in 1860, some forty-six years before Delta. The community was split into Hinckley to the northwest, Oasis to the northeast, and Deseret in 1891. Deseret means “honeybee” in Mormon scripture. Turn right onto 4000 West (SR 257) at mile 8.8 and head north. As you ride through Deseret, notice the Deseret Relief Society Hall at 4365 South 4000 West. The hall is on the National Register of Historic Places (NRHP). Turn left onto 2500 South at mile 10.8 and head west. Enter Hinckley at mile 11.6. Turn right onto Main Street at mile 11.9 and head north. Hinckley was settled in 1877. As you ride through town, notice the Hinckley High School Gymnasium and Millard Academy, both of which are on the NRHP. Turn right onto US 6/US 50 at mile 12.9 and head east. There is a mini-mart on the corner. Turn left onto 4000 West at mile 13.9 and head north. After crossing the Highline Canal, turn right onto 500 South (mile 14.9). Turn left at mile 15.9 and head north on 3000 West. In the typically dry climate, the Gunnison Bend Reservoir is a welcome sight, on the right at mile 16.3. There are a few park facilities and restrooms here. Just as the road enters the outskirts of Sutherland, turn right onto 1500 North (mile 18.0) and head east. In the distance are the Canyon Mountains. The road bends right, becoming 1000 West, at mile 19.9. If you look to the left, as the road bends right, you might catch a glimpse of the Intermountain Power Project, standing like a sentinel in the desert. Continue around the bend to head south, past some industrial development. Return to US 6/US 50 at mile 21.6; turn left here, and begin the only climb on the route: a railroad overpass. The descent from the crest of the overpass takes you into Delta—the entry into the city is abrupt and somewhat dramatic. You are now on Main Street; notice Van’s Hall at 321 West Main Street. The building, now used for commercial purposes, is on the NRHP. The only traffic signal for (tens of) miles around is at 200 West. Continue straight, and turn left onto 100 West. City Park is adjacent; the ride ends at 100 North. Check out the Great Basin Heritage Museum while at the park!